What: We would love for you to JOIN US for a SHOWER of BLESSING. Bringing gifts that will bless the ministries and the women they support. There will be representatives present from both ministries to present our gifts to as well as they will share what their ministries are doing and other ways we can support/serve their ministries. This event is an opportunity to fellowship with our church body as well as support and increase our awareness of Women's Choice Network (WCN) & YoungLives (YL) as they come alongside women facing unplanned pregnancies, and pray together. Refreshments will be provided as well are all are encouraged to join us in fun and fellowship! 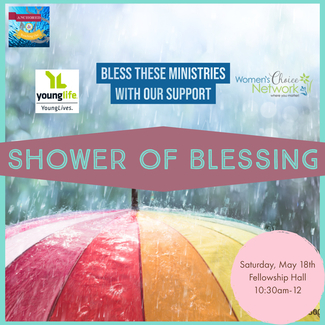 An umbrella and clouds will be found in The Tower Entrance (Main Building) and in the Barclay Building with raindrops that specify the physical blessings these organizations have identified as needs. Please take raindrop(s) of what you would like to BLESS these ministries with and bring the items with you to the shower!! (no need to wrap the gifts) Remember, we have been blessed so that we can be a blessing to others. If you cannot make it to the shower but would like to provide a blessing you can bring your item(s) to the collection location: Tower Entrance on Sunday May 5th or 12th. Please RSVP if you can join us. Childcare will be provided—PLEASE indicate need for childcare when registering. PLEASE note if you need childcare with age of child. Looking forward to this!! Please note new email!! !